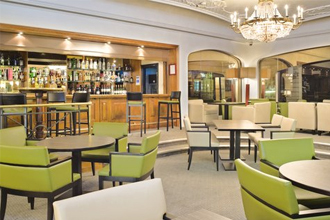 The Holiday Inn London-Mayfair is a prestige, four-star hotel located in London’s exclusive Mayfair district. The Holiday Inn Mayfair assures guests tranquil luxury amidst the buzz of Europe’s most exciting capital city. As befits its Mayfair address, Holiday Inn London Mayfair delivers imperious standards and service. With an unparalleled location on the corner of Piccadilly and Berkeley Street, the Holiday Inn Mayfair is ideal for exploring central London delights such as the quality shops of Bond Street, Burlington Arcade and Harrods, not forgetting the tourist attractions of Buckingham Palace, the Theatre District and West End with its vibrant nightlife. Hand-painted murals, marble pillars and spa baths are just some of Holiday Inn Mayfair’s opulent features. Popular with both leisure and business guests, the Holiday Inn Mayfair offers 186 spacious, air-conditioned rooms with private bathrooms. Business guests can utilize Holiday Inn Mayfair’s four conference and banquet rooms, capable of hosting up to 100 guests. Enjoy your special business or perhaps a celebration dinner in Holiday Inn Mayfair’s bright, air-conditioned meeting rooms. With so many prestigious London restaurants nearby, guests at Holiday Inn Mayfair are spoilt for choice. The hotel’s Nightingale’s Restaurant serves inventive, modern British cuisine for breakfast, a la carte lunch and dinner, whilst the Nightingale’s Lounge Bar is a popular guest and visitor bar, serving light meals all day. Famous restaurants near Holiday Inn Mayfair include Quaglinos and Chez Gerard.